The Trump administration's new policy of expanding the sale of "short-term" insurance plans as a cheaper alternative to ObamaCare is quickly running into opposition from state regulators. The Department of Health and Human Services is urging states to cooperate with the federal government, but instead, insurance commissioners are panning the new plans as "junk" insurance and state legislatures are putting restrictions on their sales. "These policies are substandard, don't cover essential health benefits, and consumers at a minimum don't understand [what they're buying], and at worse are misled," California Insurance Commissioner Dave Jones (D) said. States also fear the availability of short-term plans will drive up premium costs for ObamaCare. [post_ads]Insurers have argued that allowing plans to operate outside ObamaCare can essentially create a secondary market. The market for the short-term plans they worry will siphon healthy people away from ObamaCare. "The individuals who are able to access these plans, those willing to take the risk, they won't have significant needs, they will be disproportionately healthy, so that will lead to a more expensive individual market, and will drive up prices for those who need it," said Jessica Altman, the insurance commissioner in Pennsylvania. Earlier this month, the administration finalized rules that would allow people to buy short-term health insurance for up to 12 months, lifting restrictions from the Obama administration limiting such plans from offering coverage for more than three months. The plans would also be renewable. The short-term plans don't need to meet ObamaCare's consumer protections, so they would potentially be much cheaper than a traditional plan. Administration officials say the short-term plans will be as much as 50 to 80 percent cheaper than ObamaCare plans. But the tradeoff is that people with pre-existing conditions can be charged more. In addition, the plans to do not have to comply with ObamaCare mandates for covering certain services, such as mental health treatment, maternity care or prescription drugs. Trump officials have touted the plans as an improvement for consumers. But now officials find themselves struggling to get states on board. 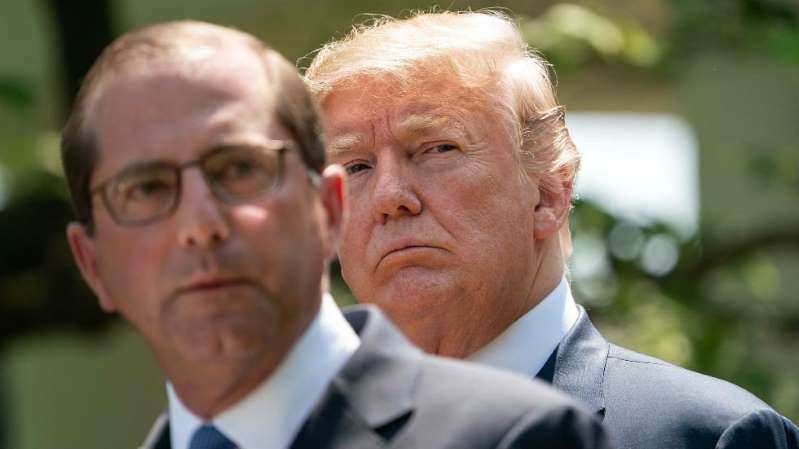 This week, Health and Human Services Secretary Alex Azar publicly urged states to cooperate with the Trump administration. During a speech to conservative state legislators, Azar argued short-term plans can provide a viable, cheaper option for people priced out of ObamaCare plans- but only as long as states don't restrict them. "This affordable option will only be as available as state legislators and insurance commissioners allow it to be," Azar said. "We believe sensible state regulation of these plans is important," Azar said. "But millions of Americans are in need of affordable insurance options, and states can help build this market outside of Obamacare's broken regulations." Azar faces a tough sell as some state officials are already taking action to limit or highly regulate the plans. California currently only allows short-term plans to last for 185 days, with an option to renew for another 185 days only. The Democratic-dominated state legislature is poised to pass a bill that would ban the sale of short-term insurance plans outright. Lawmakers in Hawaii passed a law that would essentially eliminate the state's short-term health plan market by prohibiting their sale to anyone who is eligible for a plan on the ObamaCare exchange. In Maryland, Republican Gov. Larry Hogan in April signed a bill that limits short-term plans to three months and prohibits their renewal. Mike Kreidler, Washington state's Democratic insurance commissioner, said his office is in the process of writing new rules that would limit coverage to three months, without the ability to renew the plan. There would also be strong transparency requirements. "What I worry about the most is the agents and brokers" selling the plans, Kreidler said. "They are looking at the [large] commission, and that blinds them to their legal responsibility" to inform consumers about the limitations of the short-term plans. In Pennsylvania, Altman said she has already revoked the licenses of eight brokers or agents who had been misrepresenting short-term plans. Even in a conservative state like Tennessee, insurance commissioner Julie Mix McPeak said she is concerned about whether consumers will fully understand the plans they buy. "We have to really make sure consumers know what they're purchasing, and they're aware of what's covered and what's not covered," Mix McPeak said. "The last thing we need is for consumers to have surprise bills." To supporters, Tennessee is an example of the kind of state where short-term plans can thrive. It has struggled with a lack of competition in its individual market; in 2018 there was only one insurer participating in its ObamaCare exchange. "We need competition," Mix McPeak said. "Having a plan that can be a stopgap measure, and affordable, is not necessarily a bad thing." Altman and Kreidler said they understand there can be a temporary role for short-term plans, but that's not how the administration has been marketing its new policy. "The message getting out there is that these plans can and should be looked at as an alternative to major medical coverage," Altman said. The reality though is different, she said. "There are so many things those plans don't have to do or cover, " said Altman. "So on their face, these plans are not comparable to [ObamaCare] compliant plans."